Fish Master is family friendly. One or more days spent fishing can be the best part of your vacation. Fish Master is also perfect for that special business trip. 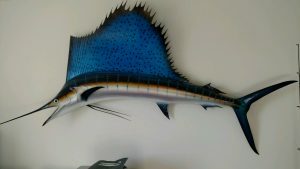 If you’re ready for a special fishing trip, please Contact Us. 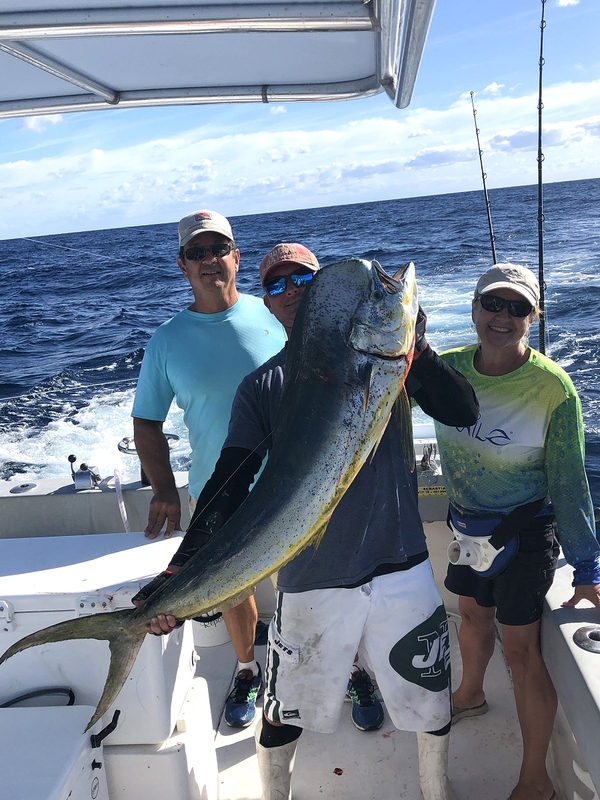 On Wednesday April 17, 2019, Dan and Jane Fastelin made the trek from Port Charlotte Florida to Sebastian Inlet for a day of fishing. 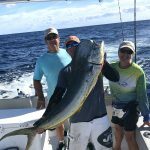 Having never fished Florida’s East coast they were excited when they arrived early for their 3/4 day offshore fishing adventure. After the daily safety briefing, we were on our way motoring to the edge of the gulf stream 31 miles offshore for 77-78 degree water. We captured 7 mahi-mahis 10-41 pounds. Dan and Jane were warriors with a fishing rod and it showed with their catch. We hope to see them again in the near future and thank you for choosing FISH MASTER, a full-time fishing business. 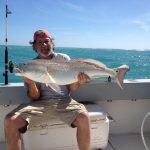 We had the great pleasure of fishing with Mr Brad S. who chartered the FISH MASTER for 3 days in a row on March 10th, 11th and 12th. On day one, Mr S. and family went bottom fishing early in the morning with hopes of Dolphin fishing. Later in the afternoon, unfortunately, the weather took turn for the worse and were homeward bound with lunch in the fish box. On day two and three, the winds stayed up so we decided to try Sebastian Inlet for Snook and Bull Redfish. After catching Masookies and Thread fins, we went fishing and caught Hard tail Jacks, Snook (over and under the legal slot size) & BULL Reds. In the end, Brad said, “I’m done, my arms are killing me.” We thank Brad for the chance and hope all the family had fun. On March 9th we had the pleasure of fishing 1/2 day with Robert W. from Miami along with his Wife and her mom and dad who live in Melbourne. 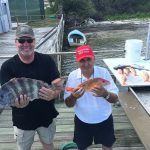 They caught Sheepshead, short Black Sea Bass, some Lane snappers and a few Short mutton snappers and trigger fish. After the trip, fish were cleaned and they were taken to the Mobay Grill in Sebastian where they were prepared four different ways for lunch. Thanks for fishing on the FISH MASTER Robert! 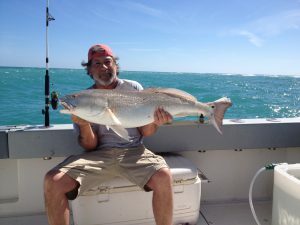 On March 1 aboard the FISH MASTER my mate Shane and I fished with the Robert S. party from Chicago on a half day trip. 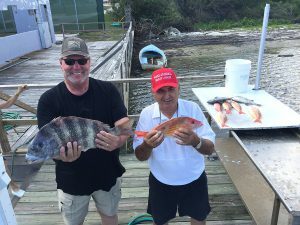 We fished a little north east of Sebastian Inlet in the Grant Pines area where we caught mutton snapper, all throw-backs. We caught some Black Sea bass with 6 of legal size with many short throw-backs and some nice size lane snappers. We were preparing to hard back when Bob and friends decided to make it a full day. 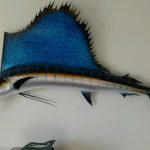 We moved to another area farther NE called locally the high bar where we had several bites connecting with some king mackerel,barracudas and released a nice sailfish. Run times were had and memories to cherish thanks Bod and crew.